If you are thinking of learning self defense, this is the place to start! The ARCS system has some great self defense techniques and explains the “why” effectively. Self defense is not for sissies and ARCS emphasizes that in order to defend yourself effectively, physical strength does you no good if you don’t have the mental strength and preparedness. Thought provoking and informative! The ideas in here make so much sense! Some of the Best Training I’ve Every Had! The videos are laid out so that’s it’s easy to use and the self defense techniques learn. Jeremy’s style of teaching makes using the DVD’s fun, none of the yelling and screaming I’ve seen in other DVD’s. My advice to anyone wanting to learn how to defend yourself is to get these videos and practice what Mr. Haas teaches. I have been training jiu-jitsu for 6 years, which gives me some self-confidence while walking the streets. Luckily never had to use it. This gives me a totally different view on self-defense, which seems to be the missing link between the martial arts and the street fight. Drastically changes my point of view, and in case of a real situation increases my chances to win. Recommended read for everybody interested in self-defense (which should be everyone these times), good start for training. So often we are given advice as to what to do in an the event of a violent attack, and more often than not this advice is only applicable AFTER physical contact has been made. As a female, I do not feel comfortable standing around waiting for some psycho to put his (or her…you never know lol) hands on me and then trying to regain control of the situation. I think this is great advice! We should always try to politely maintain control, but we should always be prepared mentally for situations when that isn’t possible….when our verbal warnings are ignored and disrespected. I need to have a plan for when the shady salesman sticks his boot in my door. Shady salesman isn’t my sparring partner. He isn’t going to stop and let me try again. He doesn’t care that he out weighs me or could knock me out with one blow (in fact, he’s probably counting on it)…I need to be prepared to put HIM on the defensive and push HIM into retreat. Not just physically prepared, as I believe was your point in the video, but mentally prepared as well….knowing all the “right moves” without a mental plan to execute is useless. I have known for awhile that I needed to learn how to protect myself but I just wasn’t sure where to go for the training. I also wasn’t sure if I could learn how to protect myself through an online video or DVD course, but then I found ARCS Self Defense! After watching just the first few short training segments it was obvious that I COULD learn how to protect myself from a video course, but it had to be the right one and ARCS Self Defense is perfect! The instructor, Jeremy, is awesome! He breaks everything down into quick and easy to learn lessons that ANYONE can learn. Many of the moves are based on your natural reflexes so anyone should be able to use them after just a few minutes of practice, just like I could. 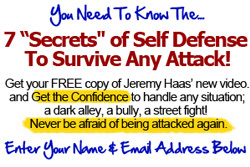 I am no longer afraid of being harmed by some crazy person because I KNOW I can defend myself thanks to what Jeremy taught me through the ARC Self Defense program. About a month ago I saw a news story of a women being attacked in her apartment not far from where I live. That got me thinking, what would I do if I were attacked? I didn’t have a clue. I thought about joining one of the karate classes where I live but I don’t have time to go to class 2 or 3 times a week. I looked at some online self defense courses but was not sure if I could learn anything with an online course. But I knew I had to do something. One of the courses I looked at was ARCS Self Defense. It had good reviews and I could try it for a dollar, so I did. I can’t tell you how excited I am about this program. What Jeremy teaches is so easy to learn. My boyfriend is getting tired of me practicing on him. You really need to give this a try. Janet C – Self Defense Video Training Testimonial – Janet tells us what she got from the ARCS self defense techniques and training. Being a law enforcement officer, many times we deal with people who have spent years honing their criminal skills in the streets and jail/prison systems. I am 45 years old and getting older everyday and it can be extremely difficult and dangerous to arrest a man half my age that is stronger, more athletic, and ruthless out of desperation. Jeremy’s way of teaching is second to none. He uses the KISS (keep it simple stupid) method to build an extremely strong base of a few tried and true techniques that have never failed me, even in times of extremely stressful life and death situations. His concept of using your involuntary reflex responses (startle response as he calls it) is ground breaking in the defensive tactics world of law enforcement. When used correctly his techniques will allow even a smaller officer to quickly gain physical control of a larger resistive subject, reducing the risk of officer injury significantly. More often than not the confrontation last only a few seconds before leaving the office in a dominate position of control allowing the office to cuff the subject and make the arrest. If Jeremy’s training works this well for me, I can only imagine how effective it would be for an average citizen when forced to protect him or herself against an unsuspecting criminal during an attack. Presently, I am assigned to the 4 Bn Royal Regiment of Scotland as an MP. A few years ago I was assigned to work on a post in the Mediterranean and Jeremy Haas was asked by my Captain to spend a few days with us to give us a different outlook on how deal with combative and resistive subjects. In just a few short, but very intense days, he opened our eyes to various pitfalls that had never been shown to us in our training. He then taught us how to correct these errors in what we had been trained in previously. Jeremy appeared to have a talent for being able to read the body and know what a subject is going to do before he does it; however, once he started showing us “tells” we all quickly realized how easy it is to defeat someone when you know how they are planning to resist, or attack. Jeremy has mastered hand to hand combat and self defence. He has countless ways to inflict massive amounts of pain and injury on you if he chooses to, and because of that I am glad he has always been on my side in a scrape. If you get the chance to spend even just a little time with him you certainly should. You will not be disappointed. I had the opportunity to train with Jeremy Haas several times while deployed in support of OEF (Operation Enduring Freedom – Afghanistan). Each time we trained together he was able to show me ways of making the hand to hand combatives I was studying even more useful. He has a gift that allows him to teach even the simplest of his techniques and combinations in a way that makes them way more effective than anything else I was ever shown when it comes to hand to hand and close quarters combat. His knowledge is a must have for someone like me. If I ever have a primary weapon failure, or run out of ammunition, I know that even barehanded I can take the fight to the enemy, survive, and return home alive. Semper Fi!